IOWA CITY — In a game that featured 10 lead changes and 24 ties, it was fitting that the final shot went through the net with 2.6 seconds remaining on the game clock, giving Iowa a 73-70 win over the Cyclones. Iowa State, however, was hoping that number was 0.0. With 27.3 seconds to play, Bridget Carleton tied the game for the Cyclones, making one of two free throws after being fouled on a lay-up. With the shot clock off, Iowa could hold the ball and try to shoot the final shot. The Hawkeyes tried to find all-american Megan Gustafson at first, but the ball ended up in Tania Davis’ hands. Davis came off of a ball screen, stepped back, and made a go-ahead three-pointer. Iowa State coach Bill Fennelly immediately called a timeout to advance the ball to half court. The ball went into Carleton, who was supposed to get the ball in the high post and see who was open for a game-tying three. Carleton got double teamed and found Iowa City native Ashley Joens standing on the baseline. At that point in the game, Joens was 1-9 from the field and 0-5 from behind the arc. The ball went up, the clock hit zero, and it went off of the front of the iron. It was Joens’ first game in Iowa City as a collegiate player. 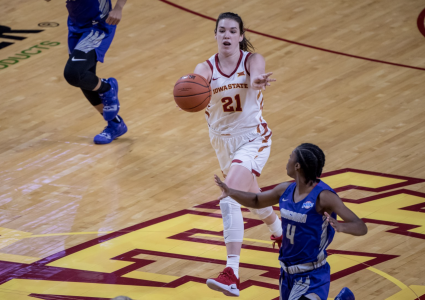 And despite the 1-10 mark from the field, Iowa State coach Bill Fennelly said there’s nothing to worry about with Joens, because of her competitiveness. 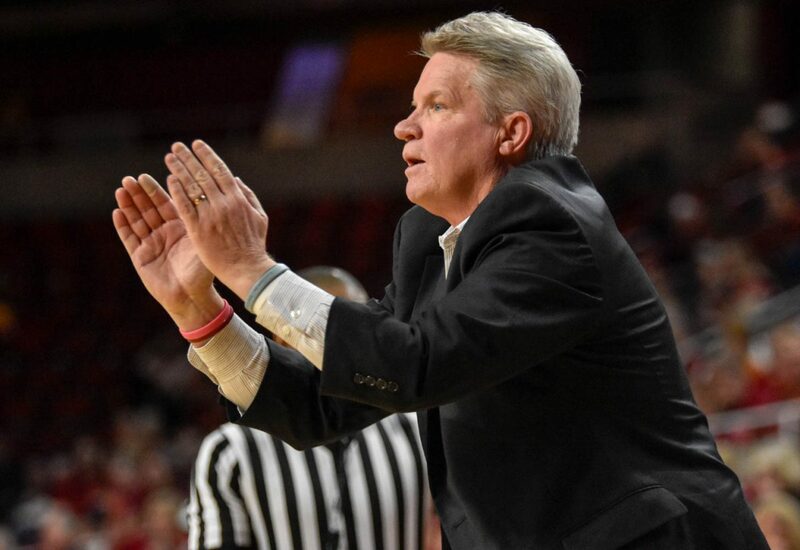 Iowa State and Iowa went back and forth all evening, but at the end of the day, Fennelly pointed to free throws as the reason the Cyclones dropped their second game of the year. The Cyclones were just above 50%, and Iowa didn’t miss any. “[When] you go 9-17 from the free throw line [while] the other guy goes 15-15, you’re going to lose on the road,” Fennelly said. Coming into the game, the Cyclones knew it would be tough to come away with a win. Iowa was ranked No. 16. The Hawkeyes had the All-American in Gustafson in their arsenal. Carver was going to be loud. The Cyclones hadn’t won at Carver Hawkeye Arena since 2006, but took the game down to the wire. Like Iowa State’s first true road game, the team got off to a slow start. The Cyclones shot 31.3% in the first quarter and missed each of their first seven three’s. It dug the Cyclones into a 21-8 hole. That’s when Alexa Middleton stepped up. On Iowa State’s eighth three attempt of the night, the Tennessee transfer pulled up and made a three pointer in the waning seconds of the first quarter to give the Cyclones a bit of momentum going into the second quarter. The three-ball was the start of a mirrored 21-8 run by the Cyclones to tie the game at 29. Iowa entered the half with a 40-36 lead, that would remain to be the biggest margin either team had over the other. 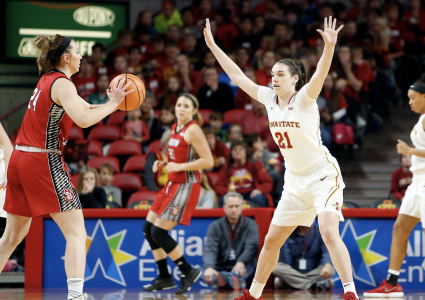 Iowa State’s defense was able to hold Gustafson to 13 points and seven field goal attempts, but the four-point lead ended up being just enough of a cushion to put the Cyclones away. The loss drops Iowa State’s record to 6-2 on the season going into Sunday’s game against North Dakota at Hilton Coliseum. The game will tip off at noon and will be televised by Cyclones.tv.